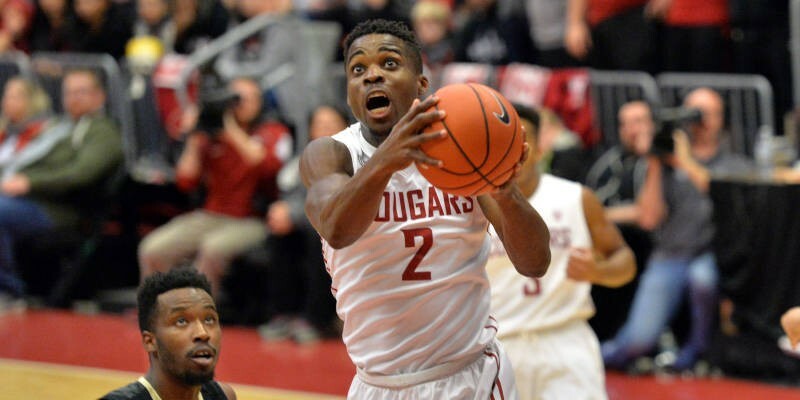 Ike Iroegbu can't do it by himself for the Cougars, who are in the midst of a five-game losing streak. After months of celebration and consternation among NFL fans, we finally have our matchup for Super Bowl Sunday, so start planning your menus for the Denver Broncos vs. the Carolina Panthers on Sunday, Feb. 7. (Allow me to suggest some pulled pork barbecue to represent Carolina, and, um, Rocky Mountain Oysters for Denver? Denver and its geriatric QB Peyton Manning managed to outlast defending Super Bowl champs New England thanks to a stellar defense, a missed extra point and a last-ditch two-point conversion that went awry. It was a pretty ugly game overall, ending up 20-18. At least the ending was exciting as the Patriots repeatedly got into scoring range, only to be repelled by the Denver D.
Facing the Broncos will be the Carolina Panthers, the team that took out the Seahawks and made the Arizona Cardinals look absolutely ridiculous on Sunday, routing the NFC West champs 49-15. Much like last week, the Panthers ran out to a big lead, but the Cards had no second-half surge in them and this one was a laugher. No doubt that Seahawks fan who hates Panthers QB Cam Newton — aka the about-to-be-named MVP — is not too happy this morning. Now we get two weeks of hype about how old Manning is, how brash Newton is, and how good both defenses are. And a whole lotta Papa John's commercials starring one of the teams' QBs. The Super Bowl is Feb. 7 at 3:30 pm Pacific time on CBS. HOOP IT UP! ALL THE HOOPS YOU CAN HANDLE! 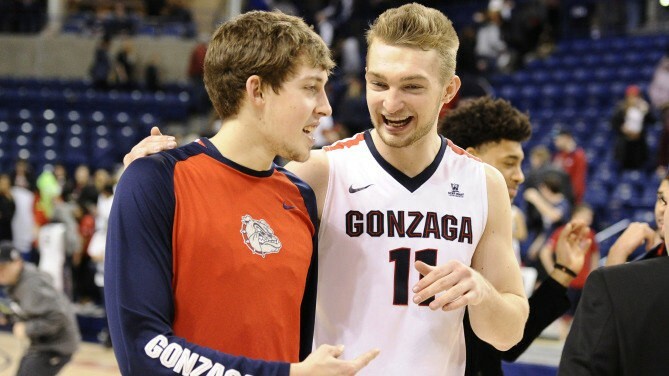 Gonzaga's Kyle Wiltjer and Domantas Sabonis. After a borderline-inexplicable loss to St. Mary's on Thursday, in which Gonzaga frittered away a large second-half lead and lost what could have been a huge win in the West Coast Conference, the team came back strong to beat the surprisingly frisky Pacific Tigers. It was close for much of the game before Kyle Wiltjer and Co. pulled away for a 10-point win. The Zags now sit alone in second place, one game behind St. Mary's, who will have to visit the Kennel later this season. Next on the docket: Two homes games this week, with Santa Clara visiting on Thursday and San Francisco coming through Spokane on Saturday. Whitworth hosted back-to-back games Friday and Saturday, and won in resounding fashion against Pacific-Lutheran and Puget Sound. The team is now 17-0, and sitting atop the NWC, two games ahead of Whitman. Next up is a roadie to Oregon for games against Linfield and Lewis & Clark on Friday and Saturday. Eastern Washington followed up a tough loss to Montana State with another one to Big Sky leader Montana on Saturday, the only matchup this season between the two teams who faced off for the conference's March Madness big last season. The 74-69 loss was essentially a showdown between the best players on the court, with EWU's Venky Jois and Austin McBroom and Montana's Martin Breunig and Walter Wright combining for 93 of the 143 points scored. Next up for Eastern are home games against Portland St. on Thursday and Sacramento St. on Saturday. Idaho's second season back in the Big Sky is going pretty well. The team took down conference leaders Montana on Thursday, but lost a close one Saturday by 2, 70-68. The Vandals were playing without Perrion Callandret and Victor Sanders, but still would have to consider the Montana trip a positive. The Vandals find themselves in fourth place among the Big Sky's 12 teams, with games coming up against Sac. State and Portland State this week. Not much good to say about the Pac 12 team on the Palouse. A promising start to the season, including an early win against UCLA and OT loss to UW, has given way to a five-game losing streak, including losses to Utah and Colorado. The Cougars are now 9-10 overall, 1-6 in the conference and in last place alongside Arizona State. This week, a tough road trip to play USC and UCLA in Los Angeles. How many female cops are in Spokane and Kootenai Counties, and why does it matter?